• Another week, another classic with a twist hits the stage. "A Christmas Carol: A One-Man Ghost Story," starring Phillip J. Berns playing all the Dickens characters, presented by Theatre Vertigo, at Shoebox Theater, 7:30 p.m. Thursday-Saturday, Dec. 21-23. Tickets: $10-$20, www.theatrevertigo.org. • For the fifth and final year, All Classical Portland presents Grammy Awards- and Country Music Awards-winning violinist Mark O'Connor and his O'Connor Band in "An Appalachian Christmas," 7:30 p.m. Friday, Dec. 22, at Arlene Schnitzer Concert Hall, 1037 S.W. Broadway. Tickets: $18-$105, www.portland5.com. The O'Connor Band won the Grammy for the 2017 Best Bluegrass Album. • On the big screen at Hollywood Theatre, 4122 N.E. Sandy Blvd., there is "Animated Christmas 6," a collection of animated 16mm winter holiday films from collector Greg Hamilton and VHS rarities courtesy of Re-Run Theater programmer Nick Wells, 2 p.m. Saturday, Dec. 23, as well as perhaps the most classic holiday movie, "It's a Wonderful Life," screening at 2 p.m. Christmas Eve, Dec. 24. For more: www.hollywoodtheatre.org. • Post-Christmas entertainment includes the Portland Youth Philharmonic's "Concert-At-Christmas," 7:30 p.m. Tuesday, Dec. 26, at the Arlene Schnitzer Concert Hall, 1037 S.W. Broadway. Tickets: $5-$55, www.portlandyouthphil.org. It's a Portland tradition since 1961, and is a mostly Spanish-themed evening with a little "Jurassic Park" thrown in. Each of PYP's four ensembles takes a turn on the Schnitzer stage; highlights are John Williams' theme from "Jurassic Park," Enrique Granados' "Intermezzo from Goyescas," and pieces from Isaac Albeniz and Manuel de Falla. 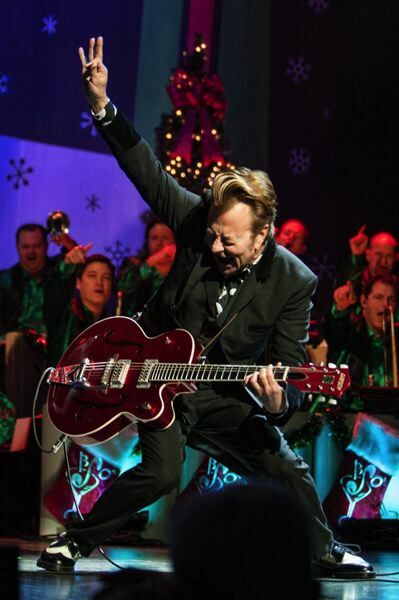 • Brian Setzer, formerly with The Stray Cats, and his 19-piece orchestra whip up some retro holiday cheer with the 14th annual "Christmas Rocks!" tour, and also play music from their latest Christmas album, "Rockin' Rudolph," their other best-selling holiday albums and classic Setzer hits. They play the Arlene Schnitzer Concert Hall, 1037 S.W. Broadway, 7:30 p.m. Wednesday, Dec. 27. Tickets: $35.50-$80, www.portland5.com. Thursday, Dec. 21, is the last night of the Christmas Ships Parade on the Columbia and Willamette rivers. Info: www.christmasships.org. ... The Miracle of a Million Lights shines at Victorian Belle mansion and its 2.5-acre grounds, 1441 N. McClellan St., through Saturday. For more: www.victorianbelle.com. ... The famous Peacock Lane and its decorated houses light up through Dec. 31, between Southeast Stark Street and Belmont Street just off Cesar Chavez Boulevard. For details: www.peacocklane.org. Shows of the Oregon Ballet Theatre's "The Nutcracker" by George Balanchine continue through Dec. 24 at Keller Auditorium. For more: www.obt.org. ... Michael Allen Harrison's "Christmas At The Old Church" stages at The Old Church, through Dec. 26. For more: www.michaelallenharrison.com. ... The Christmas Revels fetes the season with music, dance, song, theater and humor at St. Mary's Academy, 1615 S.W. Fifth Ave., through Saturday. For more: www.portlandrevels.org.